Rent Bear Spray in Jackson Hole! Carrying bear spray while hiking in the national parks & forest service areas around Jackson Hole is highly recommended. Unfortunately, if you purchase a can of bear spray somewhere you may not to be able to take it home with you. No major airlines leaving from Jackson Hole and surrounding airports allow for the transport of bear spray in carry-on or checked luggage. Teton Backcountry Rentals offers bear spray rentals starting at $8 a day . We set a cap for longer term rentals, you will never pay more than 40$ for a bear spray rental with us. 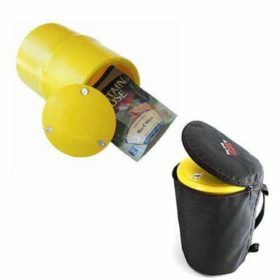 We also offer bear spray for purchase if your travels are taking you away from Jackson Hole & the opportunity to return rented bear spray to our shop. 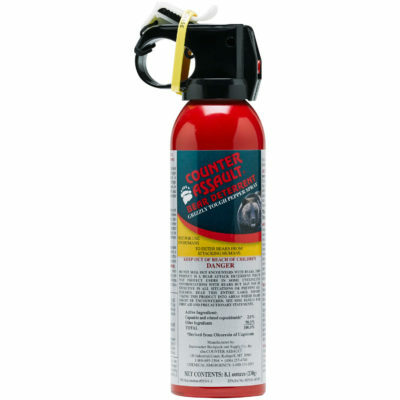 Bear spray is highly concentrated pepper spray and should only be used in the event of a potential bear attack. It is a weapon and has been shown to be 92% effective in deterring bear attacks. There are a number of situations during which deploying bear spray would be appropriate. The most obvious is a charging bear. Another may be if a bear in the area in which you are hiking begins acting in a predatory or threatening manner. A third would be a bear that has invaded your campsite looking for food and other goodies during a camping trip. You could encounter two types of bears when traveling in the Greater Yellowstone Ecosystem. 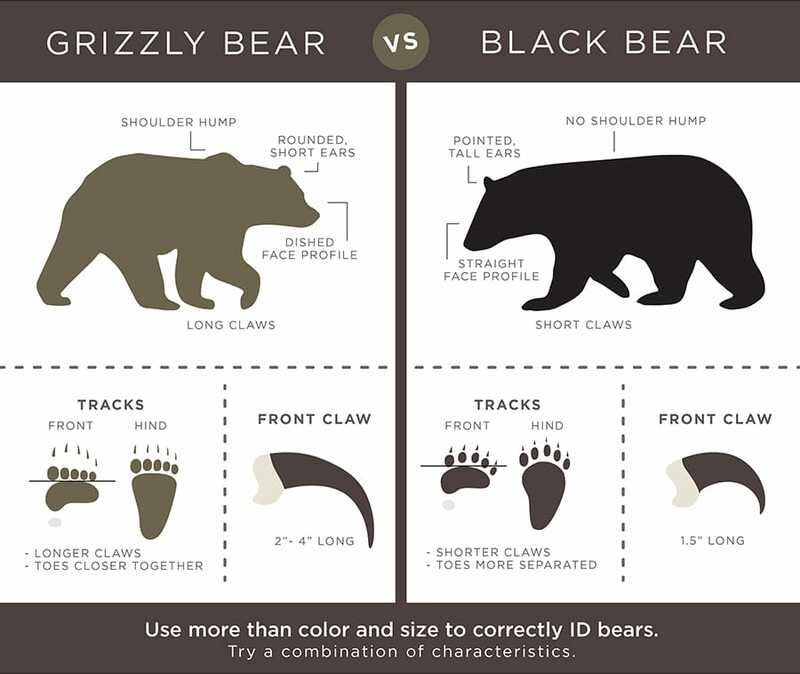 It is home to both black bears & grizzly (brown) bears, although it can be difficult to tell them apart based on coloring alone. Black bears are distinguishable by their tall, oval-shaped ears, longer snout, and their shorter claws. (But let’s hope you don’t get close enough to measure those!) Black bears also lack the signature shoulder hump grizzly bears have. In addition to their significant shoulder hump, grizzly bears are also recognizable for their large, round, often dish-shaped faces with shorter snouts and short, round ears. The shoulder hump on their back as well as their longer claws come from their propensity to dig for roots & tubers in the springtime for food. Be alert! When traveling in bear country, you shouldn’t be wearing headphones or looking down at your phone the entire time. You need to be aware of your surroundings. Travel with a partner or in a group. It has been shown that bears are less likely to attack groups of people. Properly store all scented items if you are camping in bear country. This includes not only food, but also things like scented deodorants, lotions, toothpaste, and utensils. Make sure to keep your camp clean & tidy. Never leave coolers out. Believe it or not, a bear’s sense of smell is 2100x better than a human’s, so even the smallest trace of something could peak a bear’s curiosity. Teton Backcountry Rentals primarily rents UDAP & Counter Assault brand bear sprays. Both brands use Oleoresin Capsicum as their active ingredient & are EPA-rated to be between 1.0% & 2.0% capsaicin & related capsaicinoids. Does it hurt the bear? It does not hurt the bear in the long term, but it makes them very uncomfortable. Why do bears attack people? Bears, especially grizzly bears, may attack to neutralize a threat. Most negative bear encounters happen because people got between a bear & her food source or cubs, or because people surprised the bear. 40% of negative bear encounters occur because the people involved didn’t make enough noise to properly alert the bear to their presence. I just need to be the fastest runner in the group, right? It’s genuinely suggested that you not run from a bear. This makes you look like prey, and possibly tasty. Instead, you should stand your ground, but don’t make eye contact, & put your arms out wide to make yourself look bigger to the bear. If the bear encounter continues to escalate, it could be appropriate to deploy your bear spray.